Ireland’s Best Young Entrepreneur (IBYE) competition is seeking young entrepreneurs aged 18-35 with a business idea, a new start-up, or an established business, to enter by 14th October. A 21-year-old entrepreneur who reached Ireland’s Best Young Entrepreneur (IBYE) national final last year, is using her investment winnings from the competition to break into new markets in Scandinavia and the Middle East this month. With a €2million investment fund available overall, IBYE, now in its third year, is supporting young ambitious entrepreneurs right around the country. As well as the direct financial investment on offer to the winners of IBYE, hundreds of participants also benefit from IBYE boot camps, mentoring, marketing and other supports. 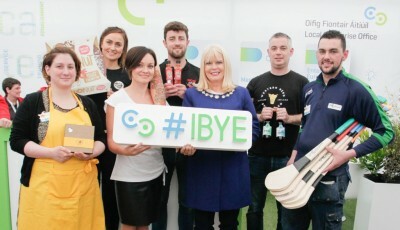 IBYE attracted 1,400 applications across the country last year. Every Local Enterprise Office has a total IBYE county investment fund of up to €50,000. The winner of the Best Established Business category in each county will receive up to €15,000 with the runner-up receiving up to €5,000. A similar amount is available for the county winner and runner-up in the Best Start-up Business category, while a total of up to €10,000 is available for each county winner and runner-up in the Best Business Idea category. The overall winners of IBYE across the three categories at national level share an investment fund of up to €100,000. Last year’s national winner in the Best Established Business category was James Keogh of Rathwood Home & Garden in Co, Wicklow, which welcomes 300,000 visitors every year to its store and family events. Further information and details about the IBYE competition are available from the 31 Local Enterprise Offices nationwide, through www.localenterprise.ie and from the IBYE website at www.ibye.ie. CAPTION: Pictured with the Minister for Jobs, Enterprise and Innovation, Ms Mary Mitchell O’ Connor T.D. were (left to right) Clo Rambaud of Clo’s Chocolates in Sligo (age 31); Orla Brady of SoulSnacks in Westmeath (age 28); Daria Adamska of Stop and Stare Designs Company in Cavan (age 34); Paul Moore of Rebel Chilli in Cork City (age 24); Michael Eustace of Western Herd Brewing Company in Clare (age 35); Kevin O’ Callaghan of O’ Callaghan’s Hurleys in North Cork (age 24).